With the thanks of funding from Cardiff University ESRC Impact Acceleration Award, St David’s Children Society (along with their Voluntary Adoption Agency partners Barnardo’s, Adoption UK and After Adoption) held two workshop events for adoption social workers, child care social workers, foster carer supervising social workers and other colleagues in education and health to raise awareness and understanding of the Adopting Together project. The events were held in Swansea and Cardiff in April 2018. 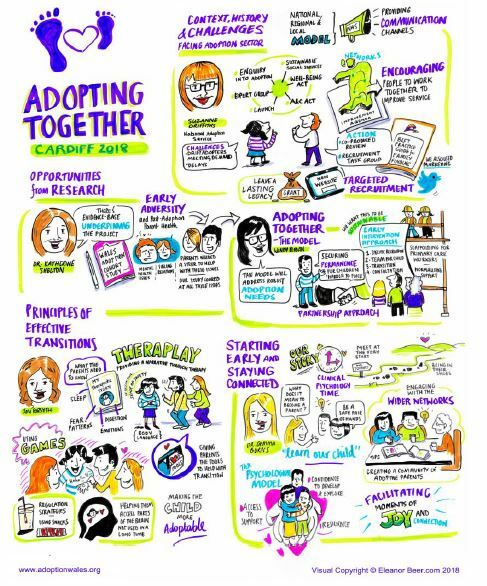 The purpose of the workshops was to discuss the Adopting Together project to generate further professional support and to maximise uptake of the project across the Welsh Adoption sector. The workshop was opened by Gerry Cooney, Chief Executive Officer of St David’s Children Society, who set the scene for Adopting Together. Presentations began with Suzanne Griffiths, Director of Operations for the National Adoption Service. Suzanne set the context and challenges faced by the adoption sector and detailed the environment in which the Adopting Together project has been established. Click here for presentation. 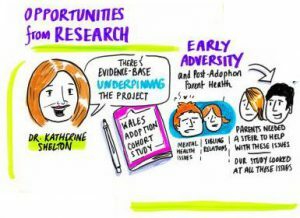 Dr Katherine Shelton from the School of Psychology at Cardiff University provided evidence from the Wales Adoption Study which highlighted the potential additional support needs of older children. This research showed that children aged 4 and over had a higher percentage exposure to all Adverse Childhood Experiences (except experience of parent’s with mental illness) compared to younger children. Dr Shelton also highlighted the specific support needs of families who adopt siblings. Click here for presentation. Click here for Messages from Research. Wendy Keidan from St David’s Children Society gave an overview of the Adopting Together model, including its design and impact. Presenting the key components of the model, Wendy also discussed the immediate and long terms impacts hoped to be achieved following implementation of Adopting Together. click here for presentation. Click here for model overview. The presentations that followed allowed for further discussion and evidence to be offered around the core components of the Adopting Together model. Jennie Forsyth gave details and examples of the model of transition used by she and her colleagues at The Family Place, which is grounded in an attachment and trauma-based approach to therapy. With the kind permission of families, she provided video evidence of this work in practice. Click here for presentation. Dr Gemma Burns from Aneurin Bevan Health Board detailed the support model currently being implemented in the South East Wales Adoption Service (SEWAS). This is a psychological model of support provided throughout the adoption journey, which focuses on the idea of building relational resilience and supporting parents to develop an attachment-focused parenting style with access to a network of specialist and peer support. Click here for presentation. With an aim of the day to generate inter-agency working though not only the delivery of information but the opportunity for discussion, the afternoon session focused on group discussions within regional or professional teams and was chaired by Kathy s’Jacob from AFA Cymru.  Groups were invited to consider their thoughts about what worked with the Adopting Together model and what needed to happen for it to fit with current practice. The collated response to these discussions was that colleagues agreed with the ethos and child-centred approach of the model. There was an expression of appreciation of the opportunity to bring multiple professionals together in discussion (including foster carers), with the enormity of the task and the level of importance set from the outset hopefully minimising disruptions.  It was felt that the provision of psychological support within a structured and consistent approach was beneficial, alongside a level of shared responsibility among professionals. 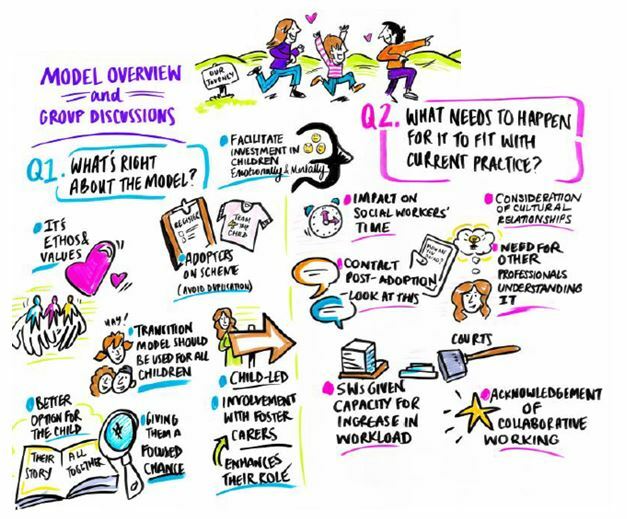 Questions around the fit of the model in practice centred on staff capacity and the need for the information gathered through Adopting Together to travel with the child. There were practical concerns around links with expected timescales and the need to ensure judiciary and panels’ understanding of the project. 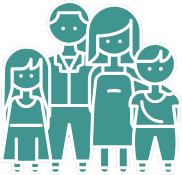 Concerns were expressed around the need to increase foster carer awareness and involvement in the model and to raise awareness with education and health professionals as it was felt they were under-represented at both events. Feedback from the workshops was very positive: attendees rated the sessions as either ‘excellent’ or ‘good’, with 100% of attendees believing that what they had heard would make a difference to children and other service users. 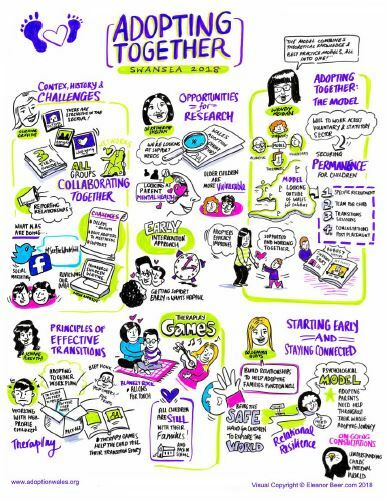 The whole day was imaginatively and thoughtfully captured in visual minutes by Eleanor Beer. The images she created throughout both days can be viewed by clicking on the images below.